My work includes references to concepts of serenity, wisdom, contemplative awareness, subtle emotion, paradox and beauty. I am drawn to these aesthetic themes for what I perceive in their capacity to express what haunts me. Drawing from a strong visual sensibility, I seek to integrate these elements to create contemporary sculptures and some 2-dimensional mixed media work that evokes narrative and response. Recent work embodies references to issues surrounding our life and times. 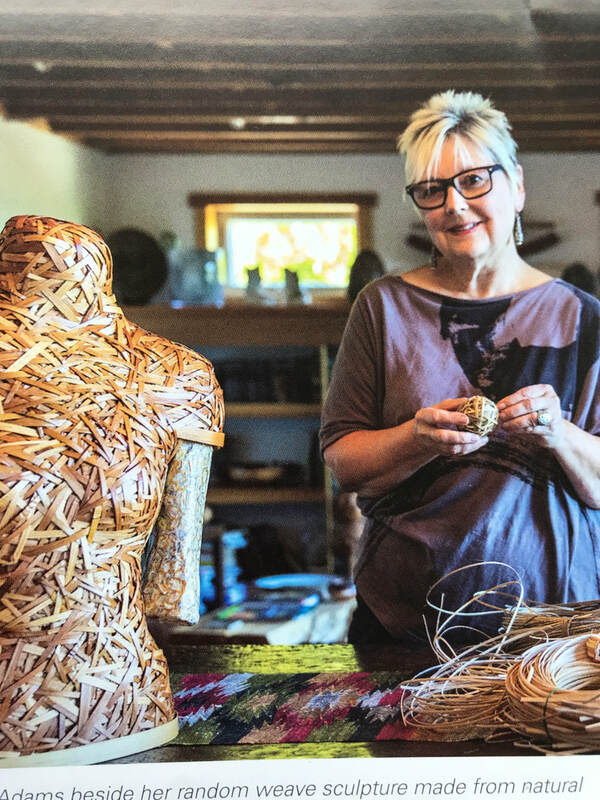 I love to use random weave and coiled basketry techniques, and materials such as wood veneer, metal, cane, reed, beads, pigment, sumi and walnut ink resist designed and altered mulberry papers; silk, found objects, repouseed metal, and bronze. I especially enjoy incorporating materials with an eye to expressing their intrinsic beauty and their relevance to the concept of the piece. My career has spanned both education and art production running in a parallel trajectory — one career as a public school teacher, principal and senior administrator, and a concurrent path as working artist. I first created jewelry that incorporated hand-made warm glass beads and medallions with world beads I had collected. They resulted in small scale wearable sculpture. My current focus is primarily medium scale sculpture, and some paintings. Over the past 5 years I have turned my full attention to the development of my sculptural craft and exhibiting. Recently I curated and co-curated two gallery shows. I serve on the Board of Northwest Designer Craftsmen as the Museum Liaison and I am also active in the Whidbey Island Surface Design organization.